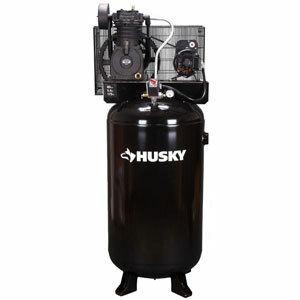 Husky company produces several types of the high-end air compressors, for those who need constant uninterrupted operation of air tools throughout the day. One of them is a two-stage Husky 80 gallon air compressor that is equipped with an induction motor 5.4HP. This air compressor provides 14.1CFM at 100psi and 13.5CFM at 175psi. It is designed for serious work, has great endurance and can work with any pneumatic tool. Husky 80-gal. air compressor equipped with rapid cooling cast-iron cylinders, each lubricated by a smooth rolling oil pump. The main difference Husky 80 gallon air compressor between the models of C802H and the C801H, is that the C802H model has a more powerful motor. Due to the fact that in the manufacture of this compressor is used cast iron, which dissipates heat very well, and therefore the possibility of overheating the compressor is extremely low. To ensure maximum control, it’s equipped with an air pressure gauge and on / off switch.